Manchester United boss Loius van Gaal has said Leicester City could go on to win the Barclays Premier League this season reports BBC Sport. Van Gaal was talking to the media ahead of Manchester United’s League tie against Leicester in a ‘top of the table’ clash at the King Power stadium on Saturday. Premier League high-fliers Leicester City have been a revelation this season as they find themselves leading the League after 13 games. The Foxes are a point ahead of weekend’s visitors Manchester United and two ahead of Manchester City and Arsenal. When Van Gaal was asked about Claudio Ranieri’s side’s chances of going on to win the League, the Dutchman replied in the affirmative. "It is possible, I think," he said. The United gaffer also spoke about the danger posed by Leicester’s star player Jamie Vardy, who is currently in irresistible form having scored 13 goals already topping the League’s scoring chart by a mile. The England international, 28, has equalled former United forward Ruud van Nistelrooy's record of scoring in 10 successive Premier League games, and could smash the record on Saturday. Also, Vardy wreaked havoc the last time the two teams met as he marked his first Premier League start by making four goals and scoring the other as the Foxes beat United 5-3 in September last year. 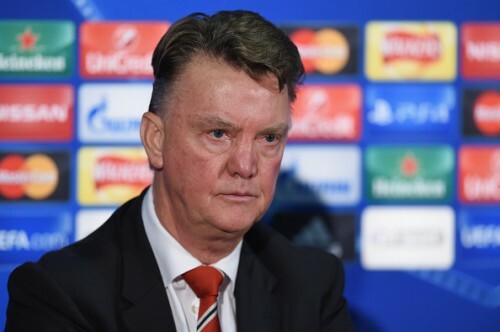 "He was already a very nasty player for us last year," Van Gaal said of Vardy. "He scores, he provoked a penalty, now scoring 10 goals in a row, he is a great player. I only know Dennis Bergkamp as a player who did the same with Ajax. It's not so easy to do that." Leicester manager Claudio Ranieri recently laughed off Arsene Wenger’s claims of Leicester City being genuine title contenders calling the Arsenal manager a ‘joker’. But the United gaffer does seem to second Wenger’s opinions. "Normally these kind of clubs can compete for long time, then at the end it becomes more difficult," he said, before Saturday's game at the King Power Stadium. "But in England because of the quality of the teams, because every team has the money to buy players - and they have bought players - the difference in the Premier League between the clubs is not so high." Van Gaal also opened up about his decision to let teen striker James Wilson to go out on loan to Brighton and Howe Albion despite a dearth of strikers at his disposal. With captain Wayne Rooney going through one of the roughest patches in his career and new recruit Anthony Martial still adapting to the rigours of the League, many had questioned the manager’s wisdom regarding the move. "He didn't contribute so much," the manager said. "He played a few minutes in the Premier League and Capital One Cup, and was not always selected in the squad. "We have to think what is best for a player like Wilson. Now he doesn't have many opportunities to play and we believe in him so he has to develop himself elsewhere. When we need him we can call him back." Is Harry Maguire the solution to Manchester United's defensive problems?